Archives : NIFTY FAILS TO OVERCOME 8668 - 24/07/2015. NIFTY FAILS TO OVERCOME 8668 - 24/07/2015. As expected the 61.8% Retracement level of Sensex 28604 and Nifty 8668 acted as a strong resistance for the market. Both the indices fell almost from near kissing distance from the above mentioned levels which implies that the Correction still continues. Hence these levels of Sensex 28604 and Nifty 8668 need to be crossed to signal the end of Correction and resumption of prior uptrend. After five weeks of upward movement, a small halt was on expected lines; but Bulls will need to worry if the 200dma (Nifty 8412) is taken out. Sensex opened the week at 28544, made a high of 28578, low of 28070 and closed the week at 28112. Thus it closed the week with a loss of 351 points. At the same time the Nifty opened the week at 8623, made a high of 8654, low of 8498 and closed the week at 8521. Thus the Nifty closed the week with a loss of 88 points. On the daily charts, both the indices made a white body candle on Wednesday which resulted in the formation of Last Engulfing Top which is bearish reversal pattern. The black body candle on next day acted as a confirmation to that pattern. On the weekly charts, both the indices have formed a small black body candle which is not exactly a bearish pattern. Thus daily pattern study suggests bearishness in the near term. The market is witnessing a pull-back of the fall from Sensex 30024 to 26307 and Nifty 9119 to 7940 and the key Retracement level of 61.8% falls at Sensex 28604 and Nifty 8668. This week both the indices made a high of Sensex 28578 and Nifty 8654 before drawing lower. The top of both Sensex and Nifty has been tested almost around four times before this fall, which has resulted in a Tweezer Top formation. Combining 61.8% with the Tweezer Top will form a strong Resistance zone i.e. between Sensex 28578-28604 and Nifty 8654-8668. Thus any close above these levels will indicate that the Correction is complete and will signal a resumption of prior uptrend. Strong Support zone exists between Sensex 27209-27174 and Nifty 8213-8186 which is a result of confluence between the Bullish Upward Gap between Sensex 27202-27175 and Nifty 8195-8186, an intermediate low made by Sensex 27209 and Nifty 8195 and 61.8% Retracement of the current rise i.e. Sensex 27174 and Nifty 8213. A breach of this support zone will pave the way to test the lows of Sensex 26307 and Nifty 7940. This week, both the indices managed to stay above the long term average of 200dma (Sensex – 27889 and Nifty – 8412), medium term average of 50dma (Sensex – 27600 and Nifty – 8342) and even the short term average of 20dma (Sensex – 28069 and Nifty – 8484). Thus the trend in the long term, medium term and even the short term timeframe continues to remain up. 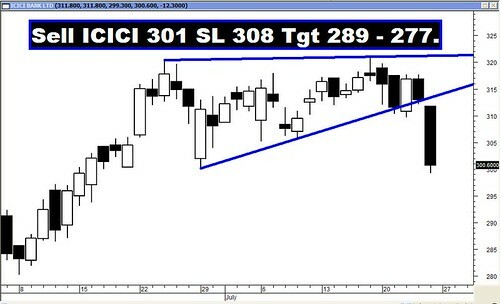 Bearish pattern formations still remain intact and hence one can still expect indices to achieve the target of Bearish Rising Wedge pattern which falls at 26049 for the Sensex and 7882 for the Nifty, as well as Ascending Broadening pattern and the target for that pattern is at Sensex 25034 and Nifty 7533. Coupled with this, both the indices had also completed a Head and Shoulders pattern and the target as per this pattern is at Sensex 24486 and Nifty 7425. The above mentioned patterns will fail if Sensex closes above 29094 and Nifty above 8844. MACD and Price ROC are positive and continue with their Buy signals. RSI (54) continues to indicate bullish momentum. Stochastic Oscillator %K (79) is in Sell mode as it is below %D. MFI (62) indicates positive money flow. OBV is moving sideways. ADX continues to be at a low level of 16, suggesting lack of strength in the current trend. Directional Indicators continue in Buy mode as +DI remains above –DI, but interestingly they have converged. Bollinger band has signaled a Buy last week and that signal continues. Thus majority of Oscillators suggest a slight bullish bias in the near term. Options data for July series indicates highest Put Open Interest buildup at the strike of 8500 and highest Call build-up is at the strike of 8700. Thus Option data suggests a narrow trading range with resistance coming in at 8700 and support around 8500.